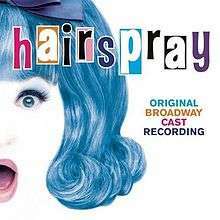 During the recording process and development of the show, many lyrics were switched around, parts added and/or cut, as the play was finalized after this soundtrack was recorded. Some songs in the stage show now differ from their respective recordings on the cast recording, including "(The Legend of) Miss Baltimore Crabs" and "Cooties". For the cast recording of the show, some songs that were present in the stage show were not included on the recording. "The Madison", one of these numbers, occurs after "(The Legend of) Miss Baltimore Crabs" and is sung by Corny and Company. The song, however, was included on the 2-Disc Collector's Soundtrack titled "Boink-Boink". Another such song, "The Nicest Kids in Town (Reprise)", sung by Corny and Council Members, appears in the show before "It Takes Two". An additional song not included on the album is "Velma's Revenge", sung by Velma after "It Takes Two", which serves as a short reprise of "(The Legend of) Miss Baltimore Crabs".